WOW, such an amazing story. Literally cried. Great post, great video…I’ve always wanted to go to another country to help people in need. Haven’t had the opportunity, sadly. Although I have a servant’s heart and just genuinely love to help others every chance I get…yes, I will admit I can still be pretty selfish. And demanding. To be expected of a teenager. Haha! Depression, for an example, is really a form of selfishness. I spent, and sometimes still do, hours thinking grumpy thoughts about how things weren’t going my way, where I’d rather be, how I felt unappreciated, blah blah blah, me, me, me. That’s how you get in a bad mood. I’m learning to always appreciate what I have…and where I’m at. I am so overwhelmingly blessed, I often can’t believe I’d still want more, when so many others don’t have what they REALLY need. Gosh, even people in the US! Thanks for this reminder, Jason! It motivates me to practice the habit of thinking of myself less…because unfortunately, it’s not a natural instinct. That was beautiful and life changing for sure. One of my co-workers went to Guatemala with Food for the Hungry and he was just blown away not only by the poverty and need but the generosity of these beautiful children and families that they had a chance to share life with. What a beautiful moment for your family! As poor as I’ve been (and I’ve been a dozen eggs and only ramen noodles for the next two weeks poor), I still only had to turn on the faucet for the water to cook both. My prayer is that others will see this and be inspired to give. Thanks for sharing your children’s voices. This is a reminder that I want to keep in the forefront. We sponsor two children right now, but Delmi, her family and community will be in our prayers. Amazing! That was such a beautifully written blog and awesome video. 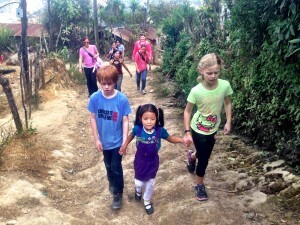 You have provided such a wonderful gift for your children and for those in Guatemala. Thank you for sharing this inspirational blog and video! We miss Grace as we now live in Florida. Also, your children are so grown up now. We miss hearing your voice in church. You have been given a truly wonderful gift–your talent! Rock on! Your kiddos are amazing! After spending time with them in Dallas/OKC, I see it even more. I spent a little more time with Haven and what a blessing, she is precious! Watching her pick out things for her #havenshope table, being excited to talk about why she is doing this and just hearing her heart for the children of Guatemala…so proud of her! She is going to change the world! Thanks for sharing this! I love the video! It’s amazing how our kids can shock the heck out of us, when we think they are going to be the worst behaved or act like they “need” items to get by, they do just the opposite!